CHIRP, SideScan & DownScan with One Transducer! 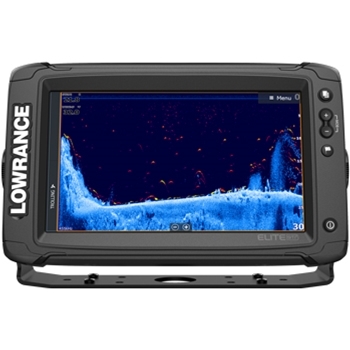 Built to deliver powerful sonar and navigational technology, the Elite-9 Ti2 from Lowrance includes built in C-MAP Lake Charting for the entire US and comes with an internal sonar and Active Imaging 3 in 1 transducer to provide you with the utmost performance. Built with 3 in 1 active imaging, the Elite Ti2 will provide M/H CHIRP, DownScan and StructureScan for exceptionally detailed underwater images with the included transom mount transducer - See below and to the left and right of your vessel in near photo like detail and see fish holding areas like rockpiles, standing timber, ditches and drop offs like never before. The Ti2 also allows touch screen control of Power-Pole anchors and MotorGuide Xi5 Trolling Motors(with a MotorGuide PinPoint Gateway). Included with every Elite 9 Ti2 is detailed C-MAP inland lake chart covering over 4,000 inland lakes with up to 1 ft. contours making it easier to find fish hotspots like ledges, drop offs, and more. The Genesis Live functionality uses digital depths and allows the user to create high definition mapping with ½ ft contours and allows each end user to contour density, depth and safety shading color palettes, and more. Create detailed Genesis Live maps in real time as you fish and save them to a micro-sd card for later use! The Elite-9 Ti2 can also be paired with C-Map Max-N+ charts, Navionics + or Navionics Platinum+ for even greater detail. With the addition of one of these charts you will also get the added benefit of automatic route planning, a menu activated feature that plots the shortest and safest course based on your boats specs. Wireless networking functionality brings a new level of sophistication to your boat. Needing cables to network are a thing of the past. Your Elite-9 Ti2 can now wirelessly share sonar images, mapping, waypoints and more to other Elite Ti2 devices without additional cables (up to 2 units total). 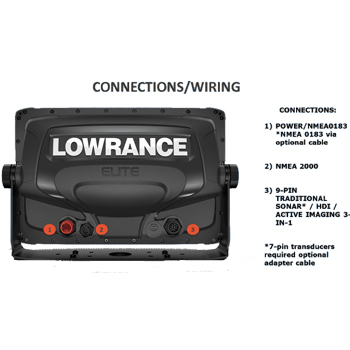 Sharing data shouldn’t be a painstaking process, and Lowrance kept that in mind when creating the Elite Ti2. Sharing numerical data between two devices is simple - the Elite Ti2 includes both NMEA0183 and NMEA2000 networking and makes connecting to another NMEA compatible device a breeze. Choose from bare wire networking (NMEA0183) or through a backbone cable setup (NMEA2000). 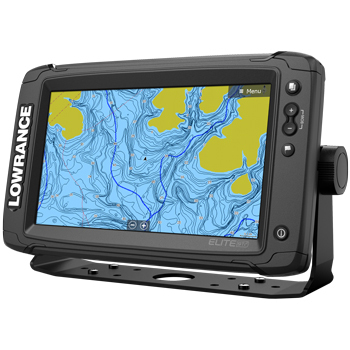 Combining reliability and affordability, the Elite Ti2 is a top contender in Marine electronics! C-Map MAX-N Continental NA-N036 US Coastal and Rivers for Navico.